It started a few years ago. I think a songbird dropped a single poop in our flower border. In that poop, the seeds of destruction were hiding. A shoot emerged the following year. Nothing to worry about, right? I donned a pair of kidskin garden gauntlets and yanked the offending shoot from the ground. It broke off suspiciously easily. A few days later, dozens more sprouts made their appearances in it’s place. Now, at this point, I must admit that I am a weed gardener. By that I mean that the only plants that survive in my flowerbed are basically weeds. Echinacea, liatris, daylily, tickweed. I planted loosestrife before I realized what havoc it was causing in our wetlands. I look longingly at Joe Pye weed and aesclepias, knowing full well they would take over whatever ground they are planted in. So I am not averse to weeds in the garden, but I want them to be there in my terms. The blackberries were pushy. They shot through the sweet yellow flowered bush my Italian neighbor gave me as a cutting. They bullied their way through the weedy flowers I had haphazardly planted. They marched across the shady spots, the sunny spots and everywhere in between. And every year I tried to pull them up, dig them out, catch them before they blossomed and bore fruit…. Because God knows if they drop seed, we are in trouble. The whole neighborhood will be taken over. But this year, I got side tracked and the canes began to blossom before I got to them. And then I realized that they were heavy with unripe berries. Hundreds of them, bright red, waiting to ripen in the sun. So, against my better judgment, I left them to ripen. Today, the harvest began. How much trouble can they cause if we are eating them, right? 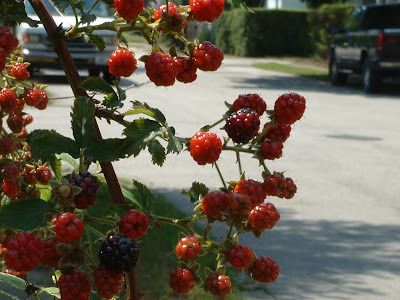 My 7 year old and I went out with a plastic container and collected the first cup of berries. We washed them when we noticed tiny green creatures crawling around on them. Tomorrow we’ll see if more are ripe. Then the next day. Then the next. In the mean time, I have my gauntlet gloves ready for the final attack at the end of the summer. But secretly I wonder if a blackberry border would be such a bad thing after all. 0 Responses to "Blackberry Surrender"